Spanish Bookmark Bundle - Greetings, Family, Numbers, Countries and More! There are 5 different designs of these Thanksgiving bookmarks. 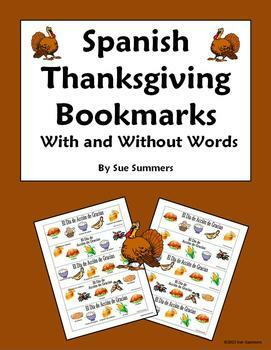 One page contains bookmarks with Thanksgiving words and one page has images only. The images only version gives the option of having students write the vocabulary words for a little extra practice. 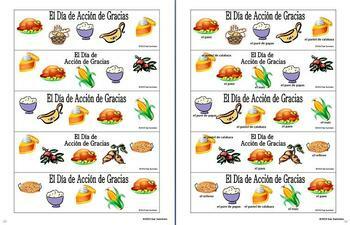 Each bookmark contains El Dia de Accion de Gracias and 5 clip art images. Vocabulary words include pavo, pure de papas, relleno, pastel de calabaza, arandanos, panecillos, salsa de carne, batatas and maíz. Just copy, cut, and share with your students! Please click here to see more of my Spanish Thanksgiving materials.